Beckmann, Ludwig (Hanover 1822 – Dusseldorf 1902). Hares Taken by Surprise. 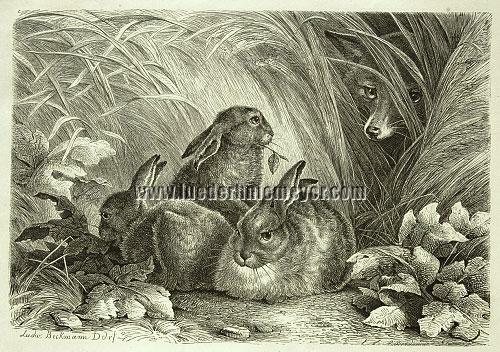 Three in the cabbage before grain through which Reynard the Fox already scents. Wood engraving by G. Treibmann for the Xylographic Institute of Richard Brend’amour (Aix-la-Chapelle 1831 – Dusseldorf 1915). (1873.) 7⅞ × 10¼ in (20 × 26 cm).